As an 11 year old, I wanted to be a footballer. But, to a kid, two dreams are better than one. And about the age of 11 I decided I wanted to be a writer as well. I was a rather chatty and communicative youngster. But while my parents are no doubt to thank for my love of words, my dreams of writing were inspired by two books. Come On, Ossie! was first published in 1985, but reprinted by Fontana Young Lions in 1987. 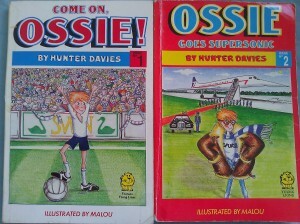 Ossie Goes Supersonic was published in 1986, but reprinted in 1988. Both were written by the Scots-born Hunter Davies, and both were devoured, circa 1994, and in monster bites, by the English-born me. Why was I so enthralled? Why did I later seek out Davies’ other works? So last week, in preparation for this post, I ordered both Ossie books from Amazon Marketplace (combined cost 2p, excluding postage). When they arrived I genuinely felt I’d been reacquainted with friends. Neither are ‘original’ prints; instead they’re 1987/8 Young Lions copies identical to those I had my mits on. But all the better. Though I’m an advocate for eBooks, I’m far from devoid of sensory investment in the physical. The look, feel and smell of the two Ossie stories are laden with memories. Though in truth the old paper smells just of…well, old paper, it conjures memories of a school bookshelf, and of windy autumnal break times enjoyed inside with book in hand. The look of each is heart-warming as well. Endearingly and unobtrusively illustrated by Malou (though who or what Malou is or was I don’t know) the images are at once immediately familiar and new again. ‘Old before my years’ I was called as a lad, but to me I was just another boy wanting to be bigger and older. Doesn’t every kid? Ossie did and we shared more besides. I ate like a horse as did Ossie.Â Ossie loves football and dreams of playing for Spurs. I loved football and dreamed of playing for Arsenal. Clearly Ossie isn’t perfect. Ossie read comics. I shared a Beano subscription. He’s fond of using and abusing new words. I loved and love words to this day; the newer the better. Ossie would really have liked to have been called Kevin or Wayne, Darren or Glenn – really good names, the sort of names real people had, not that stupid Oswald name. But perhaps more important than Ossie’s wishing to be called Kevin (and a no doubt secret love of Arsenal) is this: Through the Ossie books, Hunter Davies spoke directly to my sense of imagination, perspective and, thinking on it now, childhood. With an irreverent humour so easily appreciable in a young mind open to possibilities and so interested in oddity, Davies essentially nailed his target audience. I don’t doubt that I enjoyed these books more than others, but I doubt few young boys found them exactly easy to put down. Ossie is a typical boy of his age. That I associated with him quite so well perhaps had an element of chance to it. Chance that one day I picked Come On, Ossie! up at all. Chance that I liked football and shared other connections. But that Davies created a 10/11 year old character and his world, filled with dreams of the future and unusual adventures, so colourfullyÂ in these books is a testament to his skill as a writer. Yet even as a boy, although I was captivated by the story, I was also interested (or at least aware of) Davies ability to hook me in to it. It would be a few years before I was properly studying Literature – and more years before I formally studied the craft of writing itself – but my young brain knew what Davies was doing was important. And I wanted to do it too. And so after my encounters with the Ossie books, my outlook on writing changed. “You can be a writer”, they might have said to me. And “you can relate stories as fascinating and imagined as these”. It seemed important, powerful and of benefit. And so to an 11 year old with huge energy levels and a larger set of hopes, a second dream was born. And, really, it’s thanks to Ossie Osgoode and Hunter Davies. Hunter Davies, now 76, still plies his trade. 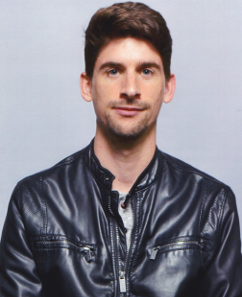 He writes (of course) a football column for the New Statesman. One that I have started to read.